The National Audit Office (NAO) has today published the findings from its review of the Thames Tideway Tunnel. This is a £4.2 billion project to construct a 25 km sewer tunnel running from West to East London to reduce sewage overflows into the Thames. This review is an update of developments since the NAO report in 2014, which found six areas that were considered critical for achieving value for money. Thames Water began studies in 2000 looking at reducing sewage overflows into the Thames Tideway. A 1991 EU Directive required the UK to protect the environment from waste water discharges. In 2012 the Court of Justice of the European Union found the UK in breach of this Directive, meaning that the UK was, and still is, at risk of fines if the problem is not addressed. As the project is scheduled to be fully operational by 2024, it is still too early to form a value for money conclusion, but the NAO expects to provide updates on the Tunnel project. The NAO is not the auditor of Thames Water, a private company, responsible for sewerage infrastructure in London and for developing a solution to the problem of overflows. It took the Department for the Environment, Food and Rural Affairs (the Department) and the Environment Agency 10 years to agree measurable standards and the specifications of the Tunnel. This process began in 2000 and concluded in 2010. Thames Water and the Environment Agency agreed that a maximum of four spills events per typical year would achieve its environmental, health and aesthetic objectives, and secure compliance with the Directive. While some EU members have set less conservative targets of up to 10 spills per year per Combined Sewer Overflow (CSO), the target for the Tunnel reflects the Department’s other objectives which go further than simply achieving Directive compliance – such as future-proofing the project against climate change and population growth. The Department endorsed the Tunnel as the preferred option in 2007 based on Thames Water’s assessment that it was the lowest-cost option capable of achieving its objectives by 2020. However Thames Water’s subsequent analysis of alternatives was less detailed, with its costing of alternatives not independently scrutinised. In 2014 the Department made the decision that pausing the Tunnel to research alternatives would likely increase the risk of fines for breaching the Directive. The Department and the Environment Agency did not fully explore uncertainty in the modelling before endorsing the full tunnel option. Models which forecast spills and dissolved oxygen levels played a key role in eliminating alternatives to the Tunnel. The Environment Agency could not provide evidence that it had sufficiently understood the impact of uncertainty on the outputs from Thames Water’s models. The Environment Agency’s consultants in 2007 reported that the models could predict dissolved oxygen levels which were overly pessimistic when compared to measurements in practice, and made recommendations to refine the modelling in 2009. The Environment Agency partially adopted these recommendations but has not carried out another validation exercise since 2007. The Environment Agency told the NAO that, although it would have been possible to increase confidence in the model results by obtaining more extensive data sets, it did not consider that any of the areas of uncertainty with the results were sufficient to justify the costs necessary to any improved data. Correcting for inaccurate predictions could have resulted in a smaller, lower cost tunnel. The closest alternative to a full-length tunnel in compliance and cost terms (The East/West Tunnel) failed not only due to unsatisfactory dissolved oxygen performance but also because it would not limit spills from all ‘unsatisfactory’ CSOs. Refinements to the sewer model after 2007 suggested that a lower capacity Tunnel could still achieve the 4 spills threshold, and this led to an estimated £646 million of savings. Further refinements could have identified the potential for further capacity reductions, albeit through reducing the diameter of the tunnel, which estimates suggest reduces costs relatively less than reducing the tunnel’s length. The Department considers that the cost of rectifying a tunnel with inadequate capacity would be prohibitive and that the Tunnel chosen offers greater certainty that it will be future-proof. The current cost estimate of the project is £4.2 billion. It is still unclear how much Thames Water customers will pay for the construction of the tunnel. Tunnel costs added £13 a year to the average household bill for Thames Water customers in 2016-17. The company forecasts the bill impact will peak at between £20 and £25 by the early 2020’s. The Department forecasts that the benefits of the project will be between 1.8 and 3.1 times its costs, however these estimates are uncertain. Approximately 60 per cent of the estimated annual benefits accrue to households outside of Thames Water’s service area, although only Thames Water customers will pay towards the Tunnel’s costs. The government has provided a contingent support package which seeks to mitigate some risks, transferring liability to the taxpayer if those risks materialise. The Department considers that a call on the support package is highly unlikely, although it estimates that the impact could be very large (£6.6 billion in its ‘reasonable worst case’ scenario) if several risks materialise. 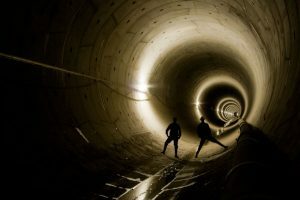 The government would provide financial support to Bazalgette (the company in charge of the Tunnel project) for a number of reasons, including if cost overruns exceed 30% or if economic or political events make it unable to access debt capital markets.